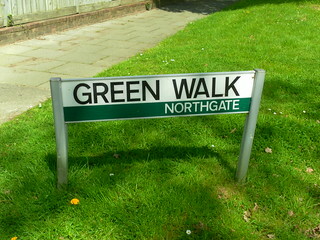 On a sunny 15th May 2012, I spent the whole day walking around Crawley and the environs of Gatwick Airport. My route was as follows: Three Bridges > Northgate > Manor Royal > Lowfield Heath > Charlwood (all the way round the edge of Gatwick Airport!) > Povey Cross > Horley. According to Google Maps, this is about 10 miles! Another in the range of street name signs in the inimitable Crawley New Town style, featuring the right-aligned neighbourhood name in a coloured band at the bottom. Northgate’s designated colour is pine green.